The Templar Tunnel is an underground passageway located in the city of Acre, in what is now Israel. 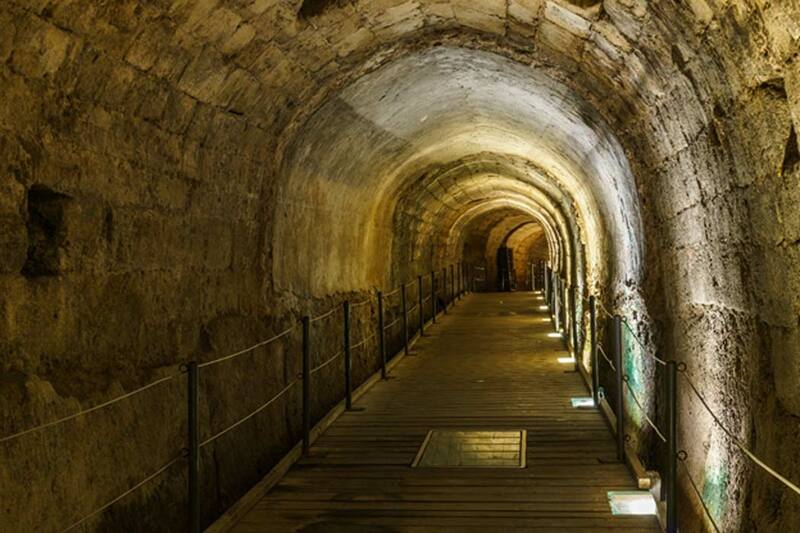 This tunnel was built by the Knights Templar when the city was under the rule of the Kingdom of Jerusalem, and served as a strategic passageway connecting the Templar palace to the port. After Acre fell to the Mamluks during the 13 th century, the Templar Tunnel was lost and forgotten. It was only in 1994 that the tunnel was rediscovered by a woman battling a pesky blocked sewage pipe beneath her house. The Kingdom of Jerusalem was established in 1099 following the conquest of Jerusalem by the participants of the First Crusade. About two decades later, the Poor Fellow-Soldiers of Christ and of the Temple of Solomon (known simply as the Templars) was founded by the French knight Hugues de Payens. This military order had their headquarters on the Temple Mount , and its main task was to protect Christian pilgrims who were travelling to the Holy Land. Jerusalem was re-captured by the Muslims under Saladin in 1187 and the Templars effectively lost their headquarters. Although much of the Kingdom of Jerusalem had been overrun by the Muslims, the city of Tyre, along with a few isolated Crusader fortresses, continued to resist. In 1189, Guy de Lusignan, the king of Jerusalem, launched the first significant counter-attack against Saladin by marching against Acre. Despite the small size of his army Guy was able to put the city under siege. 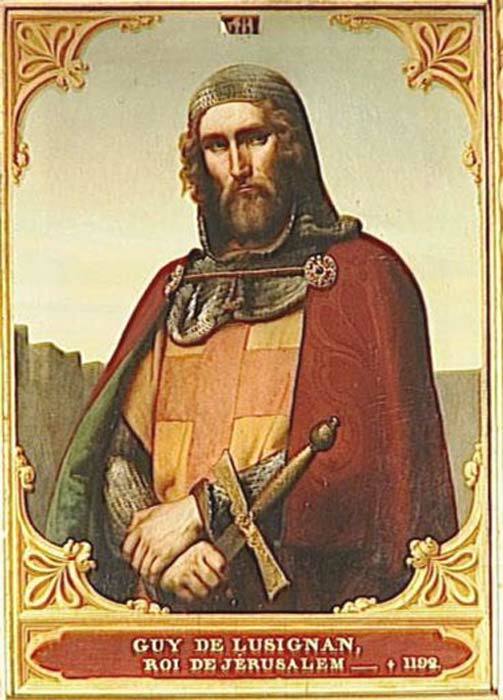 Saladin was not able to muster his forces in time to crush the besiegers, who were soon reinforced by participants of the Third Crusade from Europe. Mystery of the Knights Templars: Protectors or Treasure Hunters on a Secret Mission? Why were the Knights Templar so Interested in Harran, One of the Oldest Cities in the World? The siege of Acre lasted until 1191 and resulted in the city’s capture by the Crusaders. The city became the new capital of the Kingdom of Jerusalem and the Templars were able to establish their new headquarters there. The southwestern sector of the city was allocated to the Templars and it was here that the knights constructed their main fortress. A 13 th century Templar wrote that this fortress was the strongest one in the city and that its entrance was protected by two towers with 8.5 meters (28 feet) thick walls. On each side of these towers were two smaller ones and each tower was topped by a gilded lion. The Templar fortress marks the western end of the Templar Tunnel. This fortress is no longer in existence and the most noticeable monument in the area is the modern lighthouse. The western end of this tunnel is situated close to this lighthouse. The Templar Tunnel is 150 meters (492 feet) in length and crossed the city’s Pisan quarter. The tunnel was carved into the natural stone as a semi-barreled arch and its ceiling is supported by a layer of hewn stones. The eastern end of the tunnel is located in Acre’s southeastern sector, in an area that once was the internal anchorage of the city’s port. Today, this is the site of the Khan al-Umdan (meaning ‘Caravanserai of the Pillars’), which was constructed in the 18 th century when the city was under Ottoman rule. In April 1291, Acre was besieged by the Mamluks of Egypt and the city fell to the Muslims about a month later. The Mamluk sultan, Al-Ashraf Khalil , ordered the city’s walls, fortresses, and other buildings to be razed to the ground, so that it may never be used by the Christians again. Acre lost its status as an important port city and remained neglected until the end of the 18 th century. As for the Templar Tunnel, no one knew about its existence in the centuries following the fall of Acre to the Mamluks. It was only in 1994 that this structure was rediscovered. In that year, a woman who was living directly above the tunnel had some problem with a blocked sewage. It was when the problem was investigated that the Templar Tunnel was stumbled upon. Subsequently, the tunnel was cleaned, and a walkway, lights, and access were added. In 1999, the Templar Tunnel was opened to the public and became one of the city’s tourist attractions. The Templar Tunnel in Acre, Israel. Source: Geagea / CC BY-SA 2.0 .